Stuff required: A prize, lots of wrapping paper, printed instruction sheets, a scoreboard. Time required: 20 minutes to an hour. This is a playable game - it's finished, tested and ready to play. 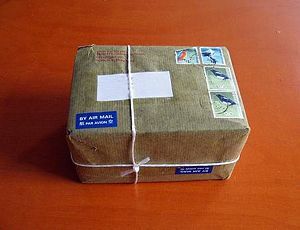 An ambient game of pass the parcel to be played at a larger party or gaming event, where the parcel moves around the venue in search of particular types of people. Find somebody here who is taller than you, give them this parcel, then write your name in the box below. You can not take the parcel again until this layer has been unwrapped. If you are leaving the playing area, even to go and play a different game, do not take this parcel with you. Give it to someone else. Occasionally throughout the night, someone will honk a horn and announce that it's unwrapping time. If you're holding the parcel at this point, unwrap one layer and read the next set of instructions. The discarded layers will be collected, and a running total of everyone's points will be kept on the wall near the door. Replace "taller than you" with other, different criteria for each layer - "find somebody here who has longer hair than you", "who has lived in [city] longer than you", "who has an alphabetically-earlier name", "who travelled further to get here", and so on. You can also throw in some minigames; "Challenge someone to Rock, Paper, Scissors. If they win, they get the parcel. If you win, they get the parcel but you can write your name in the box first." 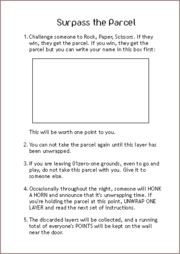 The final layer of the parcel should be "Find somebody with more points than you. ", and doesn't have a box for name scoring. Release the parcel into the wild, with or without fanfare. Every so often, sound a horn (or some other noise) and shout out to see where the parcel has got to. The current holder should unwrap it and hand you the removed instruction sheet; transfer the names onto the scoreboard, and continue the game until the final layer has been removed. Whoever removes the final layer gets the prize inside it. Every layer of the package entitles the un-wrapper to a small prize (from the moderator), but disqualifies the un-wrapper from winning the big prize. This creates an incentive to pass the parcel to another player (a la "Hot Potato"), but offers a token reward for the disqualified players. Surpass the Parcel was played at Sandpit #7. This page was last modified on 24 April 2011, at 16:38. This page has been accessed 26,465 times.